The popularity of gluten-free foods shows no signs of slowing down. Gluten-free was the top growing nutritional ingredient claim between 2010-2013. Eating gluten-free isn’t just for those who are intolerant of wheat. 65% of consumers who eat or used to eat gluten-free foods do so because they think they are healthier, and 27% eat them because they feel they aid in their weight loss efforts. However there is no research affirming these beliefs. * Download this flyer for more information on gluten. 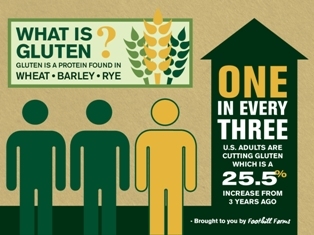 Regardless of why, your consumers are eating more gluten-free product. Foothill Farms has products to fit that demand. Download our Gluten-Free flyer to learn more about our variety of dressings, seasonings, sauces and desserts to satisfy your patrons. Also, visit our RECIPES link to find appealing, delicious ways to serve gluten-free dishes.